Hi Annabelle, if you start with vinegar and no Kombucha at all, wouldn't that be a MOV, not a Kombucha SCOBY? How is that Kombucha then? That seems very strange. 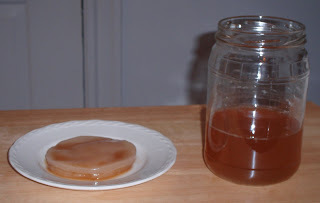 I can understand substituting a little vinegar for liquid Kombucha IF you have a SCOBY, but without the SCOBY there is no introduction of the actual Kombucha or gluconic acid making bacteria? Hi, I just found your blog and found it to be very useful! I started my tea with a store bought drink and mixed it with sweetened tea (1 cup sugar per gallon of water). It worked well but the first batch was too acidic to drink! -Alex, thanks for bringing up some good points that I neglected to mention. I was forgetting about the reformulation- it has been awhile since I have purchased kombucha in stores! I will update my blog post accordingly to address these topics. Hi Everyone. This is a great drink i believe. However i hear some rumor that somebody had the kombucha culture grow inside his stomach after drink it. Is that true ? I used to brew my own Kombucha about 20 years ago. I didn't even know it had a name. 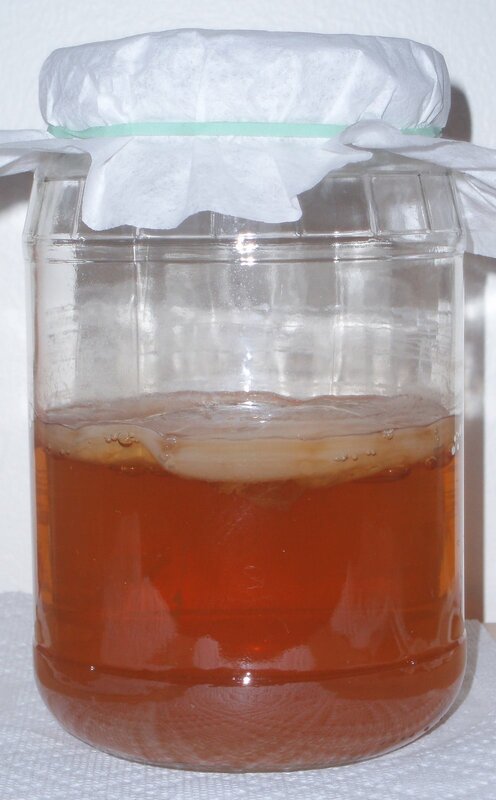 My friend's grandmother in Russia would brew it.....her Scoby was huge, several inches thick, she never peeled off her babies. She brewed her tea in a clear glass container with a spigot at the bottom. She called it Greep(sp?) & served it like an American Grandmother would serve lemonade. Only it was healthier. I made my own apple cider vinegar a few months ago. When I strained off the apples there was something that looked & felt like a baby Kombucha. It was loose & formless, I wasn't sure....wish now I would have saved it b/c surely, that's what it was. Thanks for this! 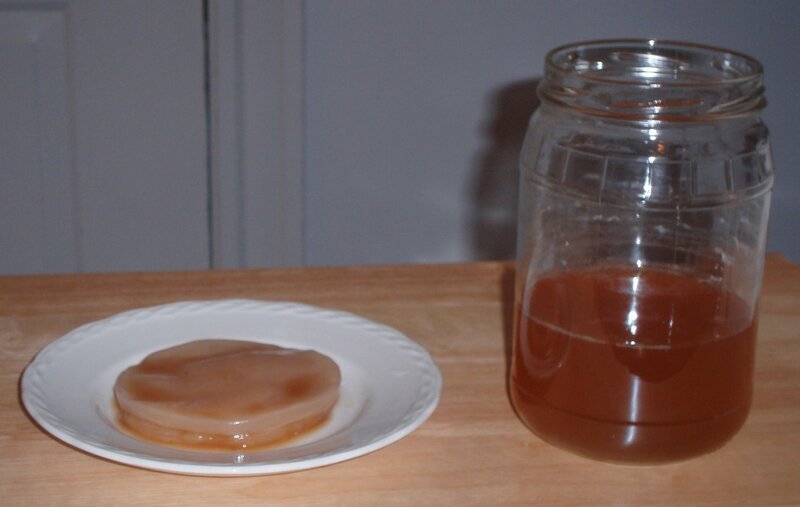 I starved my SCOBY while I was on vacation this summer (sorry, scoby!) and I'm getting tired of waiting for a friend to donate their baby! Will definitely be trying this! @zeechian- I have never heard of anyone who has had a kombucha SCOBY grow inside their stomach. I wouldn't worry about it! I know people who eat the kombucha cultures, and people who have fed the cultures to their pets. Eating the culture is considered healthy. @Jane Thanks for sharing. That is great to hear about how your friend's grandmother in Russia brewed the tea. That's too bad that you discarded the apple cider vinegar culture. Now you know for the next time! Do you know any more information about this rumor? After a disastrous experience with someone's homebrewed kombucha, I'm pretty convinced I've got one growing in me--now waiting for an appt with a naturopath, since my western doctors have never heard of kombucha. I know it loves acid, so don't see any reason why it couldn't grow in a stomach. I'd love to know more if you heard any specifics. Thanks! @Em How was the visit with the naturopath? I hope that everything turned out ok! what do you think about combining reformulated kombucha with apple cider vinegar and growing a hybrid scoby? 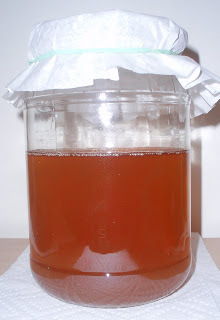 then maybe the scoby would be both strong enough for continuous brewing AND have the health benefits of kombucha? I think I am going to try it this week. Any thoughts on what proportions to use? I think that sounds like a great idea! :) Right now I am growing a new SCOBY using a kombucha culture and apple cider vinegar, and it's looking good to me. You could try a bottle of kombucha (16 oz) with an equal amount of sweet tea (16 oz), and ~1/2 tbsp of raw apple cider vinegar. Keep us posted on how it goes!